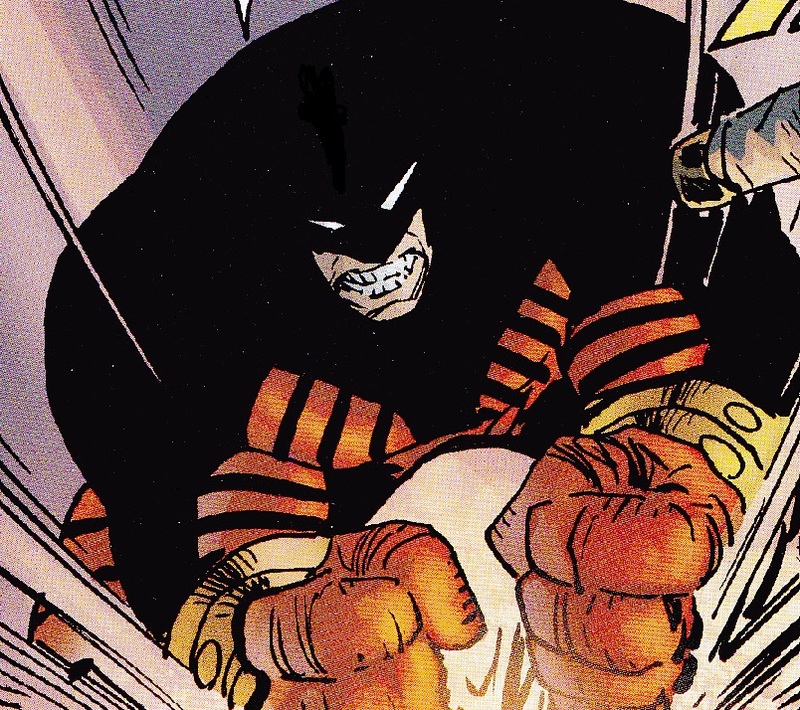 Brawn has the distinction of being the very first supervillain tackled by Ann Stevens when she began as the second Mighty Man. He’s one of the most powerful members of the Vicious Circle and has been relied on for his strength on more than one occasion. Brawn also served as one of CyberFace’s inner circle, presumably in an enforcer role. When dozens of the Vicious Circle were shrunk by Dragon using a Martian weapon, Brawn’s muscle was again relied upon. Dragon himself was shrunk by another of the alien guns and Brawn vented his frustration at the situation, relentlessly pummelling the hero with his incredible strength until they were separated in a sewer. It was not long afterwards that Brawn and the rest were restored to full size. Brawn remained with the Vicious Circle for years and was eventually selected by OverLord III as one of the candidates for his Dragon Army. Brawn was injected with the serum created using Dragon’s blood and the Freak Out chemical. He was sent after Dragon but the hero was now back to his original Emperor Kurr persona. Kurr was disgusted that his blood had been stolen and although he managed to kill all of the others, Brawn was the sole villain to survive. His own body was too powerful for the blood to explode, it instead poured out of Brawn’s body through his eyes. Brawn is present when Dart II kills FirePower and assumes control of the Vicious Circle. He is later part of a group sent to go after Malcolm Dragon, but is brutally beaten by Malcolm who had transformed into a monster.